Newsplash offers LiveU and uplink transmissions from Dover Port. Kent, UK, December 2018: If the UK leaves the EU without signing a deal, there are forecasts that the Port of Dover could face "chaos" lasting up to six months. 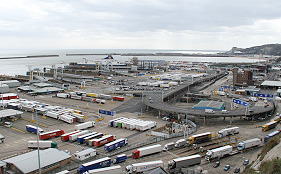 Nearly five million vehicles pass through the port each year but a No-Deal Brexit would likely see massive delays. The broadcast services company, Newsplash, which is based near the port, is offering broadcasters free footage of the port providing its credited with 'Courtesy of Newsplash'. The time-lapse video illustrates the large volume of lorries that transit the port daily.